Bosch has made the first curved instrument cluster in the world for Volkswagen. With this achievement, the company has proved that there is no more need for instrument clusters to be flat. This is the first time such an instrument panel has been used in a mass production vehicle. The curvature of the instrument cluster that Bosch made, which is part of the “Innovision Cockpit” in the new Volkswagen Touareg replicates the natural curvature of the human eye. This makes it easier for the driver to detect indicator lights and warning signals, even those at the edge of the screen. Commenting on the new instrument panel, Steffen Berns, president of the Bosch’s Car Multimedia division said that curved instrument clusters is highly useful to drivers in terms of safety and convenience. It also gives car manufacturers greater freedom and space when it comes to the design of the cockpit. The current trend is for automotive manufacturers to minimize the use of mechanical switches, knobs, and controls in the cockpit. What they prefer instead is the use of large-sized monitors, which is exactly what the curved instrument cluster Bosch has made provides. Beneath the surface of the instrument cluster, it combines a large number of digital displays, while the space this display takes up is almost two centimeters less than what a non-curved screen of similar size needs. This two centimeters makes a lot of difference from the design perspective. Depending on the personal preferences of the driver and the driving situation, the driver can choose the contents to be displayed on the instrument panel. This can include the speedometer, navigation maps, and telephone list. The diagonal size of the screen is 31 centimeters (12.3 inches) and it is big enough for most data. An intelligent control system, which is concealed behind the cockpit on a control unit and is invisible to the driver ensures that the driver sees exactly what he requires on the screen with just a glance. The information chosen can range from the directions needed for the current journey to the list of phone contacts or the details of the playlist. All these can be depicted either singly on the entire screen or shown in combination with other contents. 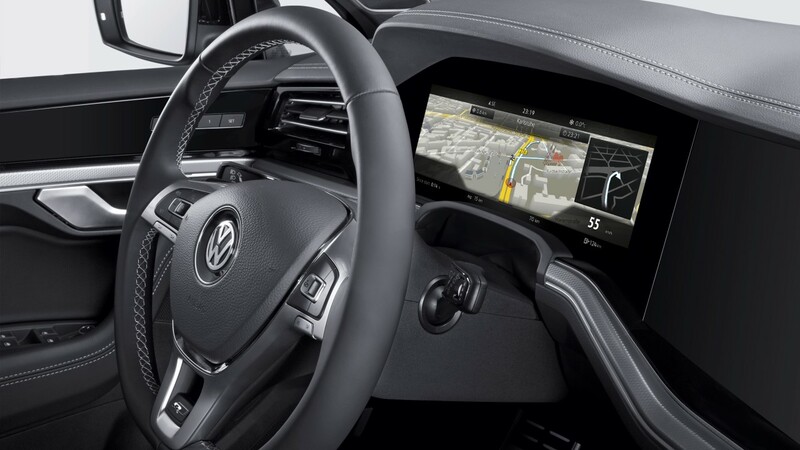 The choices can be made by using the multifunction steering wheel or the infotainment’s touchscreen. If you need to zoom into information like the targeted zone in a navigation map, this option is also available directly on the instrument cluster. This is another new feature that will be seen in the Touareg’s Innovision Cockpit. Bosch used a special manufacturing process to make the new instrument cluster. Earlier, this same process was used only to make screens for flat displays with high contrast, even in bright ambient light. For the first time, Bosch partnered with other companies to use this process called optical bonding for the first time in the large-scale production of a curved display for the vehicle cockpit. In this process, a thin liquid is used to bond the instrument display and glass directly to each other. As the two components are perfectly connected, the instrument cluster reflects more than four times less light. This means that the driver virtually enjoys a glare free driving experience and can read the screen displays accurately, even when the sun shines directly on the vehicle display. The display is rich in contrast and clear in both direct sunlight and darkness.